January always seems to be a month of imagination, an illusion that at the precise moment the holiday festivities have passed that there will be enough free time to fill an ocean. A phrase evolved as common as a holiday greeting, everyone seems to be looking towards ‘catching up’ after the holidays. Many of us say it, with full intent and sincerity. With one day left in January, I’ve yet to take Aunt Betty out to lunch at our favorite cozy winter joint just around the corner from her, and most lunch plans with friends and other engagements have been pushed off to February lining up that month to be as hectic as a holiday season sans the other details like decorating, baking, gifting, entertaining and sending out Christmas cards (the one task I failed miserably at this year… ahem and into early January… having promised myself they would simply be late.) Now I’m pondering “Thinking About You” cards. 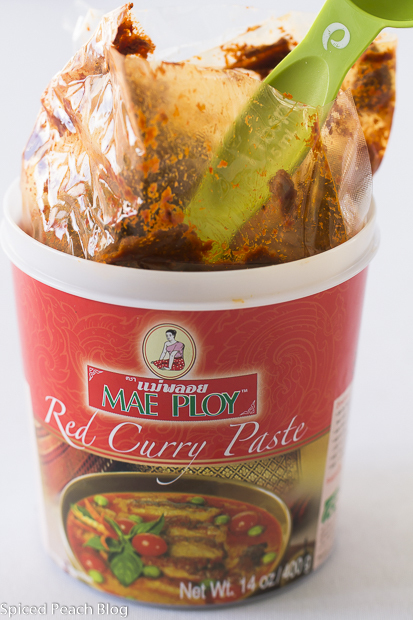 In today’s post, I’ve included photographs of the packaged ingredients so you know what to purchase at any Asian foods or International Market, Stir-Fry Noodles and Red Curry Paste. The red curry paste is simple to use… you merely need to add into the pan a bit at a time adjusting to your desired spice level before proceeding with the addition of coconut milk. I’ve found the ‘Stir-Fry’ type noodle a bit sturdier to work with and the key cooking tip here is boiling the noodles in salted water until fully el dente, not overcooked, keeping in mind the later stir-fry with ingredients, and, not undercooking, where you can still taste the flour within the dough. 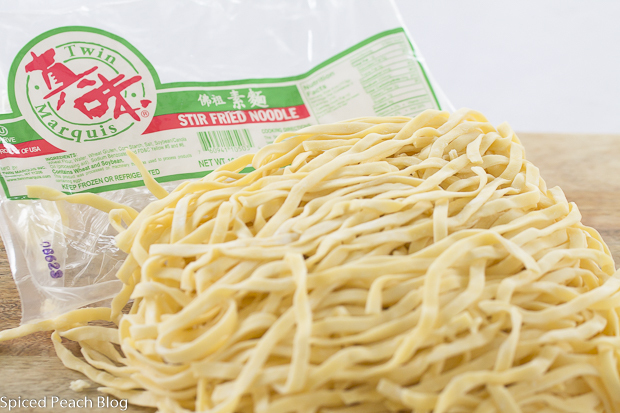 If you are not familiar with using Asian noodles I recommend purchasing a brand that provides average cooking times in English then it will be up to you to taste test surrounding that time for actual doneness. Getting back to the conversation, the big announcement in December was the engagement of Sneha, daughter of Jaya, one of the women in our Ladies International Group. This is the second among our children in the group to be married and so big excitement is bounding all around. This includes the excitement both for me and my daughter, Alex, who will travel to Kerala, India for the wedding in August. With lots of news to chat about, Jaya and my lunch plans were a bit more imminent, and thus we early on set a luncheon date at my house where we would cook together while simultaneously enabling me the means of getting back into my usual posting schedule. 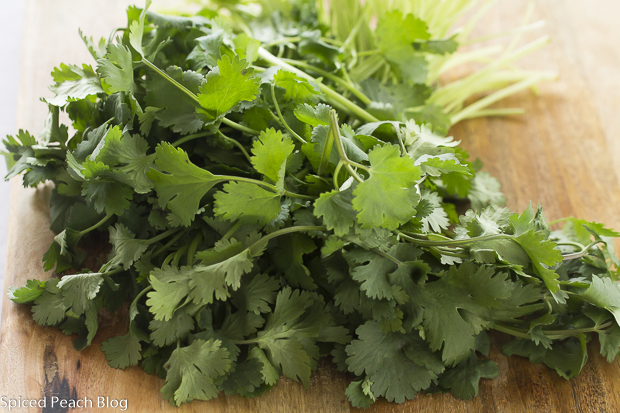 One of our dishes of the day included this simply spiced and delicious Easy Curried Noodles, Fresh Green Herbs. Not an Indian dish, these curried noodles blend flavors as described by the cookbooks namesake, “A Taste of Indochina” whose combination of ingredients favor those of Thailand, Vietnam, Laos, and Cambodia. Since those of us in our ladies group find common grounds on spice variety, oftentimes heightened, Jaya and I carefully measured out our amounts based on a serving size for four (we always split our leftovers) while being cognizant of those not accustomed to that heightened level of spice. 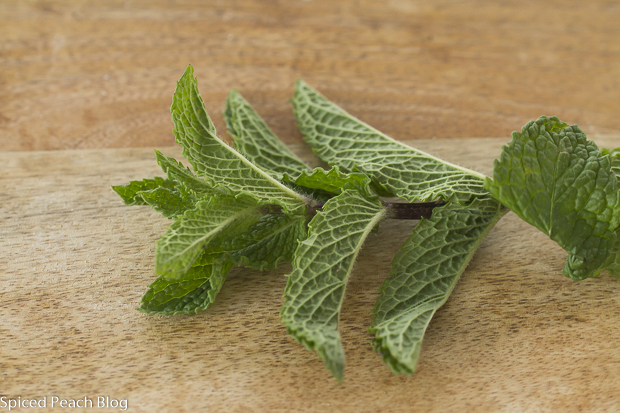 One of the key fresh ingredients among the cultural cuisines of the region includes the liberal use of bold, highly scented herbs, such as cilantro, Thai basil, and mint, you likely experience these clean flavors if you eat at any Thai or Vietnamese restaurant in your locale. Jaya remembered me having prepared this dish on a couple gathering occasions many years ago recently having a renewed craving for its cool and spice balance, and was happy I had pulled it to the forefront for sharing, or in her case, tasting and enjoying. We also savored a couple of other plates together over an afternoon, while ‘catching up’ after the holidays, and now, of course, there is plenty to chat about at the shared table in the upcoming wedding of Sneha and the exciting celebration in Kerala, India. Bring on the spice. Cook noodles in salted boiling for around 4-5 minutes until just cooked through and el dente. Do not overcook as noodles will later be stir fried with ingredients. Drain noodles, toss with 2 tablespoons oil to prevent sticking, cover with aluminum foil, set aside. Heat a large sized skillet on medium heat, pour in 3 tablespoons oil, swirl pan to cover, add in ginger and garlic, cook 2 minutes, spoon in curry paste, mix with ginger and garlic cook another 2 minutes. Tumble in the noodles and using tongs, gently lift and stir to incorporate the pan mixture throughout the noodles, drizzle over the coconut milk, toss through, sprinkle in herbs, continue lifting and stirring until ingredients are evenly mixed, pour in the fish sauce, stir through again, season with a small pinch of salt, adjust seasoning to taste. 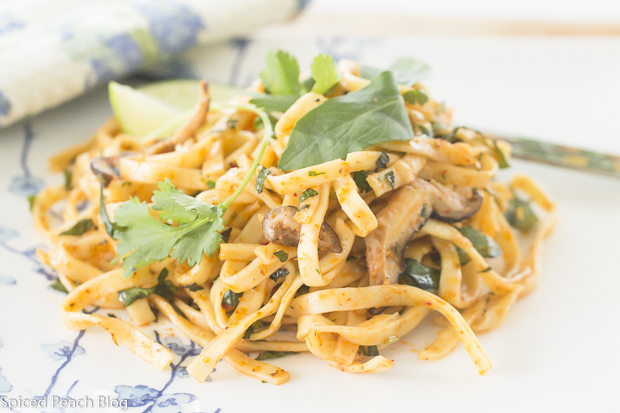 Plate curried noodles, garnish with lime wedges and fresh herb leaves. This entry was posted in Foods Around the World, Pasta- Rice-Grains and tagged Curried Noodles, Easy Curried Noodles, Easy Curried Noodles with Fresh Green Herbs. Bookmark the permalink. Post a comment or leave a trackback: Trackback URL. Yum, this looks amazing!! I love curry, I’ll have to try this version. Thank You Emily! 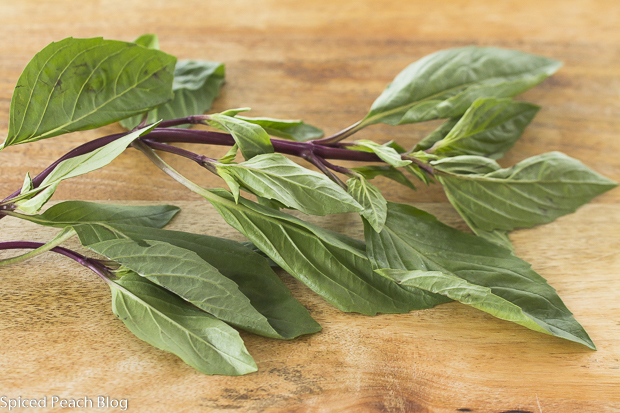 This is right up your alley… simple and fresh! What an exciting time. Will you be going to India too, Peggy, or only Alex? 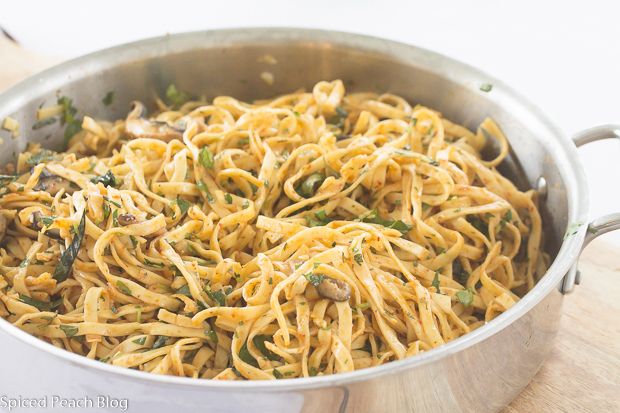 This noodle dish is right up my alley. Pinning. Thanks, Peggy! Hi Kelly, yes me and Alex are going. Thanks on the noodle dish! Hope you enjoyed Florida! Wow! India, that sounds like a wonderful trip for you and your daughter, and weddings are such a happy event. How wonderful that you are all so close in your ladies international group. I bet these curried noodles were delicious, all my favorite ingredients. Hi Cheri! 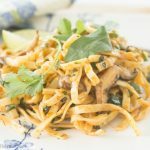 These curried noodles are so easy to prepare and very delicious with the fresh herbs cooling down the spice. I’m so excited about the wedding and visiting one of the regions in India where my long time friend is from. There are many events planned but for now we are coordinating our sari outfits for the key events surrounding. Two days after the wedding I am going to hop an hour flight to the home of another of the International Ladies Group and we are going to just have fun and tour the area. Lots of exciting things to look forward to! See you soon!